Over the last two days we went on a fantastic kayak expedition over the north coast of Ibiza. We started in Cala Sant Vicent and headed north past Punta Grosa, lighthouse. From here we followed virgin coastline exploring caves and secret coves along the way. Around mid-point of the expedition we stopped for to eat lunch – fresh rice salad with locals goats cheese! And sit back to enjoy the scenery & have a Spanish siesta. We decided the beach we’d chosen was so nice we’d stay for the night, and prepared our sleeping spot for the evening. After cooking a warm Italian Pasta dish for dinner we watched the stars for a while, then snuggled down to rest for the night. The morning light woke us up glimmering on the water! Warm coffee & breakfast on the beach and then to prepare our kayaks for the next part of the trip. We paddled to Portinax and stopped for another coffee at the new Los Enamorados Hostal Bar! 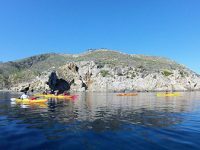 Refueled with energy we set back out onto the sea and kayaked north west to Cala Xarraca bay. Lunch-time again! Siesta! Then the final paddle from Xarraca to Moon Beach. We had a beautiful two days with a lovely group of people. Everyone winded down and reconnected with their inner peace! We paddled by huge cliffs and experienced Ibiza’s solitary side. Spotted lots of Ibiza’s endemic wildlife. It was an Ibiza adventure to remember!